In 1979, I found out I had a kidney disease following a tough tackle playing Rugby at Penn State and was told the disease would eventually lead to dysfunction, dialysis, and ideally transplant. My fitness levels have always been high as I started running for fitness at 15 playing rugby all through high school, college, and a few years after that. Following a couple knee surgeries and bad ankles, I picked up cycling in 1995 and have been addicted ever since. It all started with an organized century ride, then one a month for 5 months before I joined a club and started racing Cat 3 and masters on the road (mostly crits and road races participating in two Masters National Championships). After 23 years of 150 miles a week, my kidney function was at the point where I went on dialysis for about 3 ½ years and hoped a living donor would step forward for transplant and a double nephrectomy (kidney removal), all at the same time. During dialysis, I continued working full time leading successful hotels sales and marketing teams around the country, and fortunately was able to ride all during dialysis except the day after my twice a week, 4-hour treatments. Two-hour rides before work 2-3 times a week, and a 3+ hour ride on one weekend day kept my spirits and fitness at a high level. 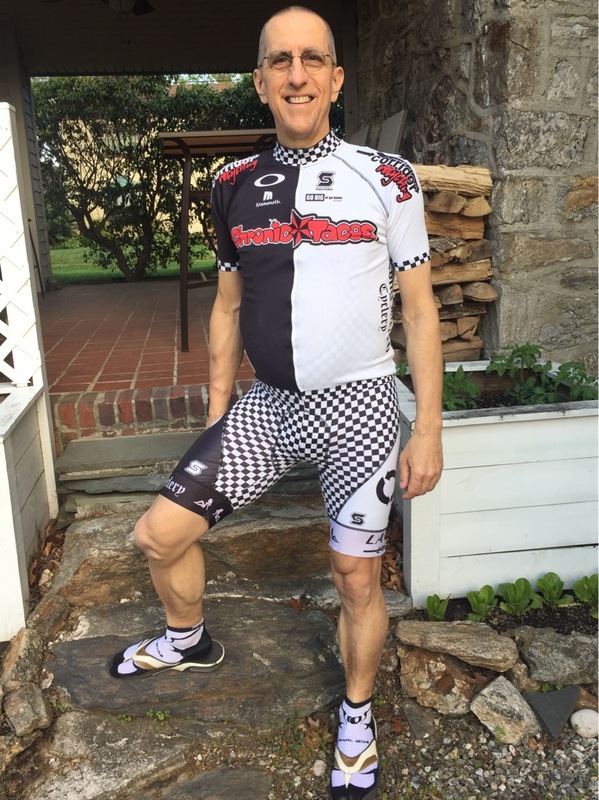 Fortunately, Colleen, an elementary school friend’s wife stepped forward to test as she saw me in my cycling team kit during a charity ride in Boston with my “beer belly” (my kidneys weighed over 12.5 pounds when they are normally 10 ounces; twins together average 11 pounds). Sure enough, PERFECT MATCH! In May 2016 they performed the nephrectomy and transplant at the same time. I was only spinning (about 35 hours a month), the month before surgery as I didn’t want anything to happen that would jeopardize the transplant. Surgery went great, 4 weeks later I was spinning; at six weeks, riding 100 miles a week outside. Less than 4 months later, I planned to ride a small fundraiser metric century with my donor and her husband. We left 10 minutes after the 100 milers and about 5 minutes in, our group of 20-25 was just one - me. Rather than slow down or wait, I tried to catch the 100 milers. As I approached the 17 mile rest stop, they were pulling out. In another 3 miles I caught them. At the metric century turn-off, I decided I didn’t want to ride the last 38 miles alone so continued on with the 15 or so 100 milers. There were 3-4 others along with me that shared the pace-making and 4 of us were the first finishers. I felt great and shocked how well I rode, especially those last 15 miles. No cramping, nothing, again, all less than 4 months following an 8-hour procedure. We moved to SLO in February 2017 (after beautiful stints in Monterey and Long Beach), and have been loving it, mixing our family hikes with mountain biking and lots of road rides. This year, my focus is to participate in an organized century ride in CA once a month. 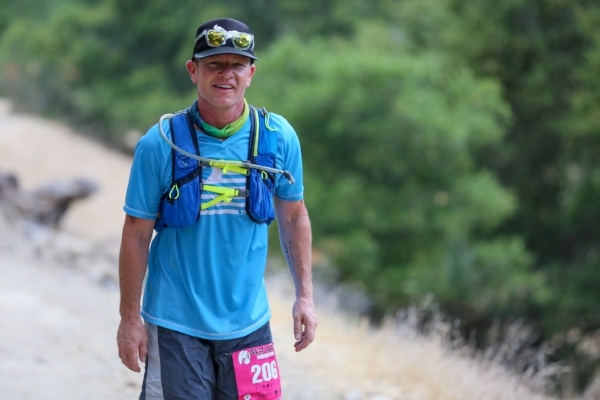 All is good, my new kidney is working great and I love supporting Race SLO, taking the long route on the SLO Ultra MTB, volunteering for the Marathon, and participating in other regional events in the region like Eroica California and the SLO Triathlon. In support of the donor community, please register as an organ donor on your driver’s license since there are so many others wait-listed for transplant who aren't as lucky as I was. You never know who in your family, or maybe a friend, may benefit from this enormous act of kindness. See you on two wheels! I’ve spent most of my life in Atlanta, but after visiting San Francisco in 1992, that was it! I would make it out west someday and that was that. Then on April 16, 2001, my world changed. I lost my mother to cancer after a long six-month battle. I have always been a runner, but had never run more than 6 miles. My running buddies thought it would be good for me to train for a marathon. Not having run nearly that long before, but being the driven “I can do anything” person, I said yes. We trained for the Marine Corps Marathon in Washington, D.C. in October, 2001. I remember the race very well. As we ran past the Pentagon, where the damage of the 9/11 attacks just happened, I was overcome with emotion. It was not only my first marathon, at a difficult time, but then passing what was left behind from what happened to our country on Sept 11, 2011 – was overwhelming. The Marines were at the finish line putting medals over our heads – I remember how I felt – but the next thought that came to my mind was OK, I’m ready for my next race! I did four more full marathons afterwards, three in California, and too many half marathons to count. I came out to run the San Francisco half marathon over the years many times, always knowing I’d be back to live on left coast for good. I still do the SF half marathon every year. When my daughter finished college and my son high school, it was time! We packed up and headed west. We moved to SLO without knowing one single person. I keep up with friends and family on the other side of the country and miss them very much. But I can truly say I am a happier person being where I was meant to be. My runs have so much more meaning. When I run I can work out my thoughts, plan my days, revisit situations needing attention and just get inspired to live more productive days. At 55, I can honestly say that running has given me the strength, energy and power to make every day count. There is a long trail from my home in San Luis Obispo, CA, near Broad and Orcutt Avenues, to the train station and beyond. On TV, I watched a 90-year-old run a long race to the finish line. I thought if he could do it so can I, at 74 years old. I tried the trail again. I passed the spot I stopped at the last try. I kept going. I saw the picture of the 90-year-old man in my mind. I kept moving forward at a faster pace. I saw places I had never imagined on the trail, never thinking about the distance I had gone. I saw two guys playing Frisbee. I saw people on bikes and running on the trail. I kept going. I saw houses and neighborhoods. Next I saw a wrought iron fence. I saw shacks and train parts. Could I be getting closer? Next, I saw the steps to somewhere. As I got closer they were the steps to cross over the trains and train tracks. I went over the bridge. I saw the locomotives. I took the stairs down. I saw a statue of two men setting train rails many years ago. I made it! Don’t ever give up! The trip back was easy. I thought of Rocky and Rocky’s theme music played in my head. I wanted to stop and dance and put my arms in the air. I didn’t! 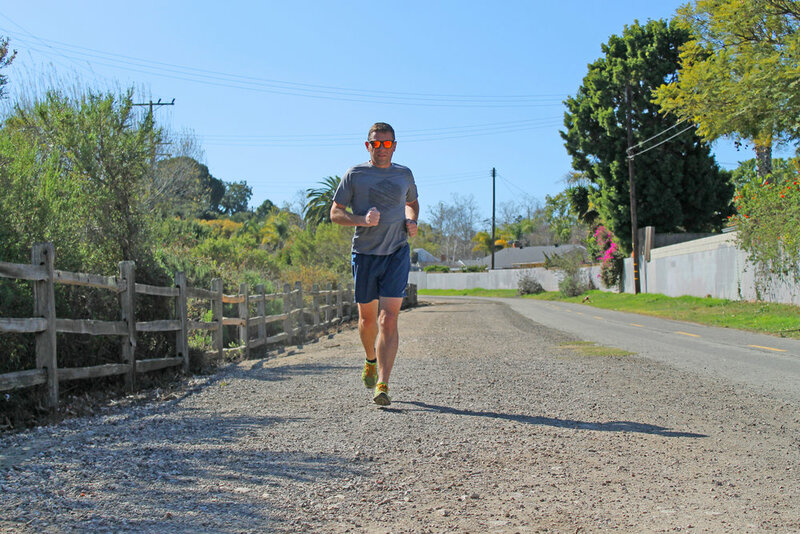 I hadn’t run consistently since my last half marathon in 2015, and when I became a Race SLO ambassador, it was part of a resolve to reestablish the healthy habits and routines required to train for the race. My goal was to PR, which meant beating my time from the last time I ran the SLO half marathon in 2013. As a grad student with an infant son at home, the road back to race shape was a steep one, which required sacrifice not just from me but from my wife. She very much partnered with me in my training, carving out time and space for my long runs, encouraging me to eat healthy and stay the course. On race weekend, old friends came alongside me to ‘strive together’ towards my goal. My upstairs neighbor in San Francisco gave me a slick new haircut (look good, feel good, do good.) A former pastor of ours from Calvary SLO allowed us to stay at their AirBNB unit in Grover Beach. Some good friends cooked us a great pre-race meal, allowed me to borrow their car to get to the starting line in time and sent me along with a sandwich and bar for my early morning nutrition. My wife showed up to cheer me along on the course. My good friend (who helped train the Grizzly Academy team) shouted encouragements when we ran past each other. The pacers I ran most of the race with helped coach those of us in the pace group through the hills and wind, helping us reach our best effort. And I had the honor of striving together with all the other runners participating in the race that day. The good vibes were downright tangible. The result? I ran with the pace group that would have seen me beat my previous time by almost two minutes. At around 11 miles, I realized I had started out too fast and had no gas left in the tank. The pacers encouraged me to power through it, and helped me hang on with the pace group for another half mile or so before I dropped back a little bit. I ran the last mile and a half at a much slower pace, still pushing as hard as I could. I got a fresh burst for the homestretch and bolted across the finish line, content just to finish. Then I realized that I had still beat my previous time…by a matter of six and a half seconds. With a margin so slim, I am confident that I wouldn’t have beat my time without the support of each of the friends and family I mentioned above (and more I failed to mention). I mean we’re talking about less than a half second per mile pace differential. The thing I love about this vision of competition is that it has more to do with community than contention. And we’re better for it. I’m already looking forward to next year. Will you sign up for 2019 and strive together with me? 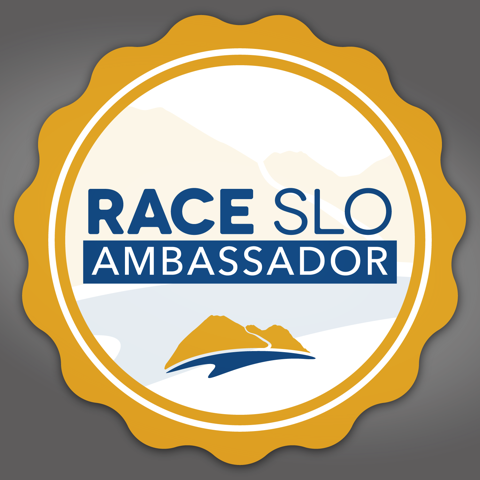 EARLY BIRD REGISTRATION for the 8th Annual SLO Marathon + Half + Relay Races is now open. Racers can register HERE. Early bird pricing runs through May 6, with half marathon as little as $55 and full marathon $75. 5K and relay races registration is also available. In 2010, I decided to quit my job in France. I had been working for ten years as the editor in chief of an important newspaper and my life was absorbed by my work. I even slept once a week in my office and spent too little time with my family. I wanted to see my kids growing and be more supportive of my wife’s career, so I made a radical decision. 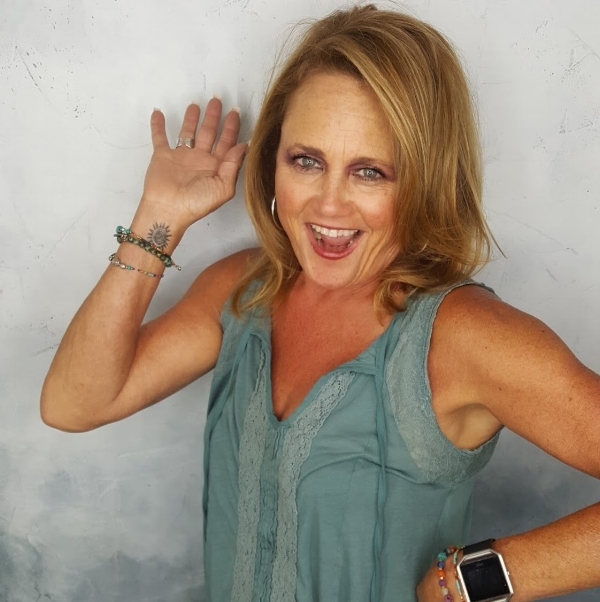 I was 39 and found myself at home 24 hours a day. I enjoyed my first months as a house dad, but I also felt that I needed something else. I was very competitive in my work, so I was looking for something with a bit of a challenge. I’ve always been in love with sports, playing basketball in my younger years at a semi-professional level, then playing tennis for quite some time. I was living 10 miles from Paris, near an empty field and a forest, so I started to run. At first, I was pathetic. I wasn’t able to do more than 3 kilometers (less than 2 miles) in 20 minutes. I was totally red, huffing and puffing, and my body was so sore the days after that I considered quitting to do something else. But I have my pride, so I trained more, and quickly made some progress. I joined an amateur running group with some friends and neighbors, and I was hooked. Six months later, I moved to Santa Barbara. The perfect weather conditions allowed me to run more often, but without any training plan or watch to keep track of the time and distance. I wanted to listen to my body and find my own natural pace. Finally, two years after my first awful workout, I signed up for a 10K in April 2012. I managed to cross the finish line in 47 minutes. Not a great time, but it made me realize that I was able to do more. And I did. Since that first race, I ran more than forty of them, in Europe and in the United States, every distance: mile, 3K, 5K, 4 miles, 10 miles, half-marathon. I had some good results and some bad ones. I made some mistakes along the way, then struggled with a plantar fasciitis for eight months at the beginning of 2014. But I’m still running. I also had the chance to meet some great people, some fantastic runners and the “camaraderie” is something I have never experienced in other sports. That’s what makes running so special – I don’t “fight” the other runners, I admire them and I’m inspired by their performances. So far, my greatest satisfaction was when I officially became a marathoner. It was on May 1st, in San Luis Obispo. Even if my time wasn’t great, I enjoyed every minute of it. The course was gorgeous, the volunteers amazing and the organization more than great. I cannot wait to do it again, this time with the secret goal (not so secret anymore!) to get my BQ. Running is now a big part of my life. I can’t describe how good it is to put my running shoes on every day. I’m not a great runner, but I enjoy the feeling and the experience, even on a bad day or a bad workout. Moreover, I love to compete… against myself. I don’t run to be better than anyone. I run to be a better me.